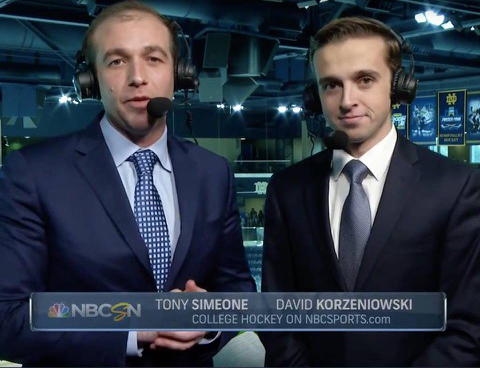 University of Notre Dame Stamps Scholar David Korzeniowski shares his love of sports and storytelling as a television broadcaster. Korzeniowski grew up in Sudbury, Massachusetts, outside of Boston and attended St. Sebastian’s School, where he was involved in Moot Court, a debate club. He realized he had a passion for public speaking as well as sports. Through his subscription to Sports Illustrated Kids, he learned about Play By Play Sports Broadcasting Camp. For six summers, he practiced talking in front of a camera and hosting radio shows and heard from speakers in the broadcasting industry. “I got really excited about it and could see myself in their shoes,” he said. He became involved in the high school A.V. Club, which put on morning announcements, and was the basketball team manager. He wanted to attend a college with strong sports broadcasting and a journalism program. Currently a junior, Korzeniowski is majoring in film, television, and theater. Outside of class, he is part of Fighting Irish Media, the communications wing of the Notre Dame athletics department. He broadcast his first game spring of his freshman year and has gone on to broadcast for over 10 sports, from basketball to soccer to track and field. He spends hours researching team stats and individual players. He estimated he’s called between 50-75 Notre Dame games. He also works with NBC during the football season, helping behind the scenes in production and meeting experienced broadcasters. Last summer, he used his Stamps Scholarship enrichment fund to intern as a broadcaster for the Falmouth Commodores of the Cape Cod Baseball League, a competitive summer conference. He called 45 games as the team made the play-offs. This summer, he will return to the Commodores as a play-by-play broadcaster as well as the head media intern. Beyond sports, he writes for the monthly campus student magazine Scholastic. 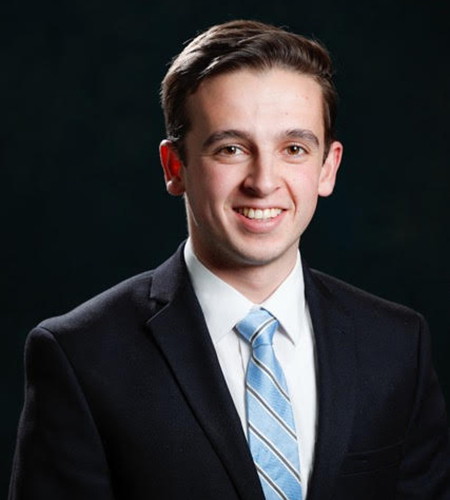 Serving on the editorial board, he has the opportunity to go outside of his journalism comfort zone, most recently writing a cover story about mental health on campus. For fun, he enjoys playing basketball and running through campus. He’s participating in his first half-marathon in April. He also works in Notre Dame admissions, organizing recruiting weekends for prospective students, and is involved in community service. Last spring break, he went on a trip Kentucky, where he volunteered at The David School, a place for students with educational disabilities. Currently, he is planning a senior thesis exploring how media and sports are ways for the international Polish diaspora to connect with their homeland. Korzeniowski is of Polish descent and his father encouraged him to explore his heritage. He hopes to take his first trip to Poland this spring to conduct field research. After graduating, his goal is to be a play-by-play college basketball broadcaster, but he is looking into minor league baseball and production jobs that could lead to this dream position.